Posted March 1, 2011 by Guillaume Plessis & filed under Redis. Redis is an open source, advanced key-value store. It is often referred to as a data structure server since keys can contain strings, hashes,lists, sets and sorted sets. You can run atomic operations on these types, like appending to a string; incrementing the value in a hash; pushing to a list; computing set intersection, union and difference; or getting the member with highest ranking in a sorted set. In order to achieve its outstanding performance, Redis works with an in-memory dataset. Depending on your use case, you can persist it either by dumping the dataset to disk every once in a while, or by appending each command to a log. Redis also supports trivial-to-setup master-slave replication, with very fast non-blocking first synchronization, auto-reconnection on net split and so forth. Other features include a simple check-and-set mechanism, pub/sub and configuration settings to make Redis behave like a cache. You can use Redis from most programming languages out there. Redis is written in ANSI C and works in most POSIX systems like Linux, *BSD, OS X and Solaris without external dependencies. There is no official support for Windows builds, although you may have some options. Redis is a must-have for any modern LAMP stack. Its 2.2.1 release is now available on Dotdeb for Debian 6.0 “Squeeze” in amd64 and i386 flavors. If you want to use it with PHP, please install the php5-redis package. Posted February 22, 2011 by Guillaume Plessis & filed under MySQL. As usual, please read the Changelog of this maintainance release before upgrading. Note 3 : if you had issues with loading the InnoDB plugin on Squeeze, your feedback is welcome (post a comment below). Posted February 6, 2011 by Guillaume Plessis & filed under Miscellaneous. Today is a great day for the Debian community : Debian Squeeze has been released. After 24 months of constant development, the Debian Project is proud to present its new stable version 6.0 (code name Squeeze ). Debian 6.0 is a free operating system, coming for the first time in two flavours. Alongside Debian GNU/Linux, Debian GNU/kFreeBSD is introduced with this version as a technology preview . The website of the Debian project also got a facelift. Please visit it for more information. Therefore, if you want to stick to Lenny, change all the occurrences of “stable” to “oldstable” or “lenny”. Posted January 31, 2011 by Guillaume Plessis & filed under PHP. Do you know Pinba? It’s a great tool and you really should use it on your LAMP platform. 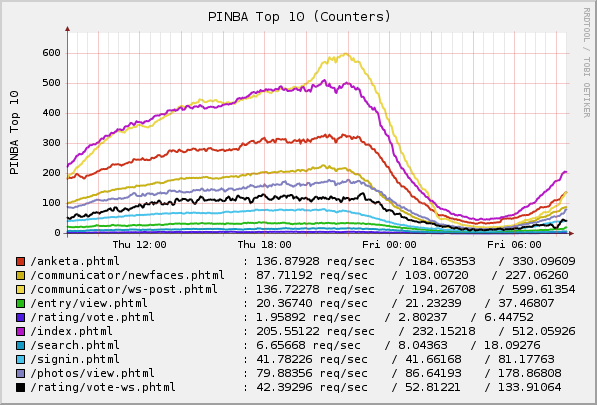 Pinba is a realtime monitoring/statistics server for PHP using MySQL as a read-only interface. It accumulates and processes data sent over UDP by multiple PHP processes and displays statistics in a nice human-readable form of simple “reports“, also providing read-only interface to the raw data in order to make possible generation of more sophisticated reports and stats. Pinba is not a debugging tool in a common sense, since you’re not supposed to do debugging on production servers, but its main goal is to help developers to monitor performance of PHP scripts, locate bottlenecks in realtime and direct developers’ attention to the code that really needs it. pinba-mysql-engine : a custom MySQL engine to store all the gathered data efficiently. It has to be installed with the latest mysql-server packages. php5-pinba : the PHP extension you’ll use to accumulate data and timers directly from your PHP scripts. Posted January 11, 2011 by Guillaume Plessis & filed under PHP. MySQL (or Percona) Server 5.5 will replace MySQL Server 5.1. More info here and here. And, of course, feel free to donate if you find Dotdeb useful. Posted January 7, 2011 by Guillaume Plessis & filed under PHP. This release resolves a critical issue, reported as PHP bug #53632 and CVE-2010-4645, where conversions from string to double might cause the PHP interpreter to hang on systems using x87 FPU registers. The Dotdeb packages for Debian “Lenny” 5.0 are now available. You really should upgrade. Posted January 3, 2011 by Guillaume Plessis & filed under PHP. After PHP 5.3.4 has been released by the PHP Group and after the corresponding Suhosin patch has been published by Stefan Esser, the PHP 5.3.4 packages for Debian “Lenny” 5.0 are now available on Dotdeb. Thanks for your patience. Follow these instructions if you’re installing them for the first time. And as usual, please read the full announcement and the Changelog before upgrading. PHP 5.2.16 has been released by the PHP Group a few days after PHP 5.2.15 (fixing an open_basedir issue). It is now available on Dotdeb for your Debian “Lenny” servers. This maintainance release marks the end of support for PHP 5.2. You are strongly encouraged to upgrade to PHP 5.3 (read this migration guide). Please read PHP 5.2.15 and 5.2.16 release announcements and the full Changelog before upgrading. Posted December 18, 2010 by Guillaume Plessis & filed under MySQL. MySQL 5.1.54 packages are now available on Dotdeb in amd64/i386 flavours for Lenny and Squeeze. Now, about MySQL 5.5 (I was asked on Twitter or in the comments here), it will be available on Dotdeb as soon as it is in Debian Sid or experimental. Please be patient. If you don’t need some 5.5 specific features, such as semi-sync replication, and if you just need to boost your InnoDB performances, you really should take a look at your /etc/mysql/my.cnf file and enable the InnoDB plugin.